Hello friends, hope you all are fine and having fun with your lives. Today, I am going to share a Traffic Signal Control Project using Arduino. 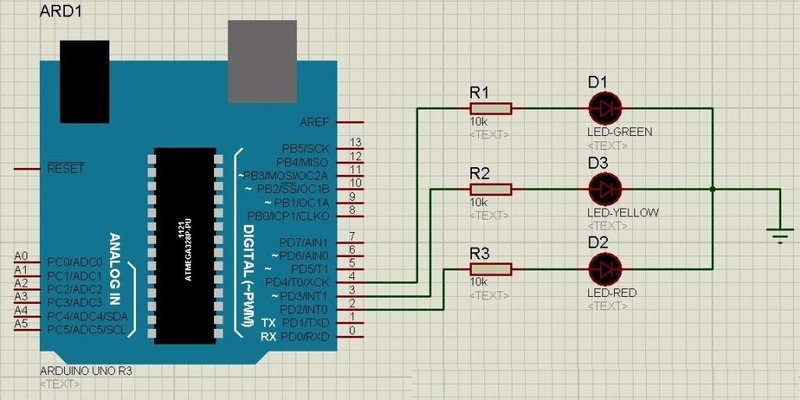 Few days earlier, I have posted the same tutorial but it was Traffic Light Signal Using 555 Timer in Proteus ISIS and today we will do the same thing but using Arduino programming. 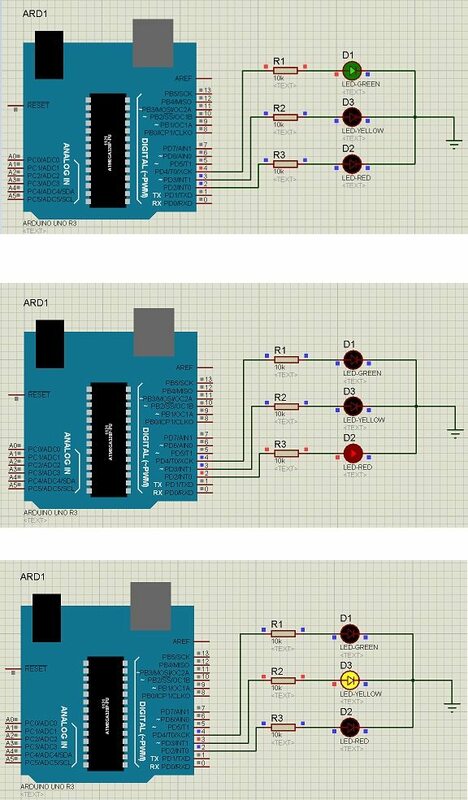 Its quite a simple but good starting project onArduino. So, if you are new to Arduino then must give it a try. Traffic Signal Control is quite a usual thing. We see traffic signals daily on our roads and usually engineers are asked to design such projects in their initial semesters. If we look at the traffic signals then we can see they are simply turning ON and OFF lights at some fixed regular intervals. and the pattern is quite simple as well. so I have simply followed that pattern and design the code. So let’s start with designing this project. Its quite a simple project so the circuit is quite simple as well. 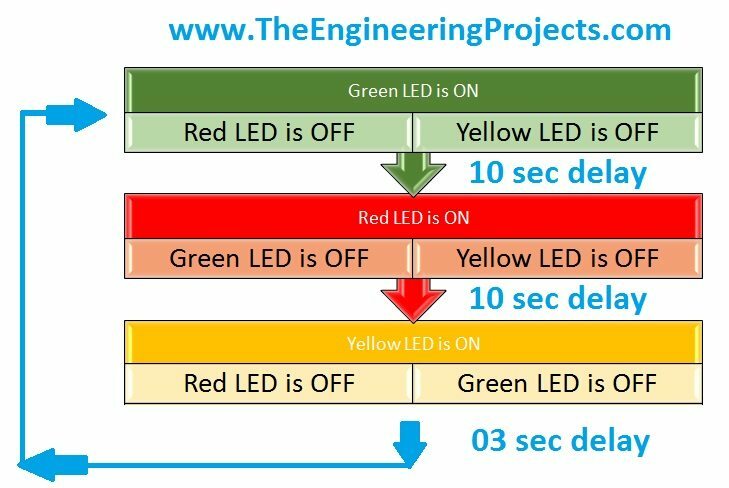 You can see I have just placed an Arduino board and plugged three LEDs with it and obviously they are Green, Yellow and Red in color. These LEDs are attached to pins 2,3 and 4 of Arduino UNO. That’s the complete code for this project and I think its quite self explanatory plus I have also changed the color accordingly. First of all Green LED is ON and the rest are OFF which is shown in green color. Next Red LED is ON and the rest are OFF after around 10 seconds which you can change by changing these delays. Finally the Yellow LED will be ON and you can see it goes OFF just after 3 sec because it has short delay, you can change these delays quite easily. Below is the flow chart of above programming which will clear the theme properly. Now compile your Arduino code and get the hex file. If you don’t know How to get the hex file then read Arduino Library for Proteus. So that’s how it will work, I hope you got this clearly as its quite simple, will meet you soon in the next tutorial. Till then take care!! !